It’s been a trying season in Vancouver, but there’s reason to believe better days are ahead. 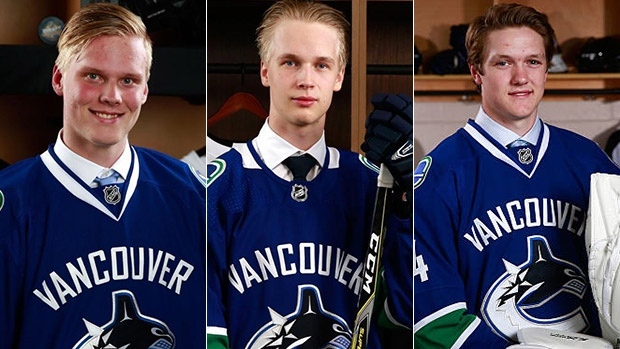 TSN Hockey’s annual list of the Top 50 NHL-affiliated prospects features five Canucks, including top-ranked Elias Pettersson, a 19-year-old centre currently playing for the Växjö Lakers in the Swedish Hockey League. Only players considered to have not achieved full-time NHL status are included in the Top 50. The rest of the top five is rounded out by Eeli Tolvanen (No .2), a right winger and Nashville Predators prospect who has 34 points in 47 games for Jokerit of the Kontinental Hockey League this season; Martin Necas (No. 3), a Czech centre and Hurricanes prospect who had 11 points in seven games at the World Juniors; Cody Glass (No. 4), a centre and right wing for the Portland Winterhawks who’s property of the Vegas Golden Knights; and Casey Mittelstadt (No. 5), a centre for the Minnesota Golden Gophers and Buffalo Sabres prospect who was a star for Team USA at the World Juniors. The 6-foot-1, 165-pound Pettersson has been a revelation in the SHL this season, racking up 17 goals and 45 points in 35 games to sit third in league scoring. The 2017 fifth-overall pick is joined by fellow Canucks prospects Olli Juolevi (No. 24), Adam Gaudette (No. 26), Jonathan Dahlen (No. 31) and Thatcher Demko (No. 42) in TSN’s top 50. Juolevi, a 19-year-old defenceman who was the fifth-overall pick in 2016, is playing for TPS Turku in Finland’s top league this season after spending the previous two years in the OHL with the London Knights. Gaudette, a centre who was a fifth-round pick (149th overall) in 2015, has 20 goals and 42 points in 28 games for the Northeastern Huskies to lead the NCAA in scoring. Dahlen, a 20-year-old left wing for Timra IK in Sweden’s HockeyAllsvenskan, is second in league scoring with 37 points in 35 games. Demko, 22, sits fourth in American Hockey League save percentage (.929) in 29 starts for the Utica Comets. The Calgary Flames are second among Canadian franchises with three players on the list – Tri-City Americans defenceman Juuso Valimaki (No. 18), Harvard University defenceman Adam Fox (No. 36) and Kelowna Rockets forward Dillon Dube (No. 38), who captained Canada to gold last month at the World Juniors. The Oilers, Jets, Maple Leafs and Canadiens don’t have any players in the top 50. - The Philadelphia Flyers have four players in Top 50 ­- goaltender Carter Hart (No. 19), defenceman Phillipe Myers (No. 30), and centres Morgan Frost (No. 33) and German Rubtsov (No.47). - Three Russian goaltenders made the top 10 this year - Islanders prospect Ilya Sorokin (No. 7), Rangers prospect Igor Shesterkin (No. 9) and Ilya Samsonov (No.10 ) of the Washington Capitals. All three have a good chance to be No.1 goalies at the NHL level. - Twenty-nine players on our list are first-round picks.